There was a time when Orleans was the second most important city in France after Paris; today it is a modest and attractive city well worth a visit to explore its cobbled streets. Orléans' long history stretches to a time before the Romans, but its most famous event was Joan of Arc's deliverance of the city from the English in 1429. The occasion is still commemorated most fervently with Joan of Arc Day, celebrated each year on the 8th of May, when Orléans makes merry with lively street parades in medieval style. 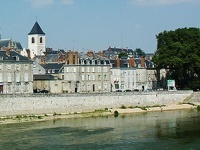 The city's chief attractions include the magnificent neo-Gothic Orléans Cathedral, Cathedrale Ste-Croix, which is truly magnificent and mustn't be missed, and the House of Joan of Arc, which is a reproduction of a house she stayed in in the city and features a timeline of her life and achievements. There is also the Orleans Musee des Beaux-Arts to be explored, and the ornately decorated Hotel de Ville. Visitors can rent bikes in Orleans and this is a lovely way to get around in the city; a glorious cycle path which traverses the Loire Valley region passes through Orleans.